As I was working on the quilting design, it was important that the machine quilting should highlight the boutis with a complementary frame. I kept the design to rounded feathers and scroll shapes to imitate the rounded petals of the boutis flower. In France, just as in North America, the debate between traditional methods versus contemporary methods is quite lively. There are some boutis artisans that hold fast to the premise that any idea or technique that does not adhere to the strict rules of the tradition of the craft, is not authentic boutis. I certainly agree with that, and I have a great respect and admiration for the beautiful, intricate hand work created, for which time and patience are a prerequisite. In fact, I have become quite enamoured with the tradition of boutis and have a great respect for it. However, I believe every age creates it's own traditions when we adapt these inherited crafts to our present day circumstances by using the new information and technology that is available to us. I believe it keeps the craft relevant and alive. 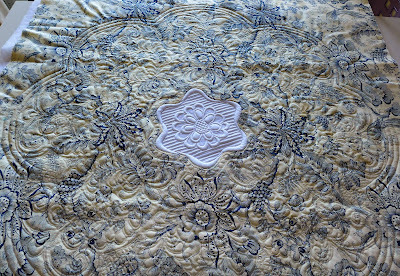 When "white corded quilting" (later referred to as boutis), first made it's way into France in the early 17th C, the artisans and craftsmen of the ateliers in and around Marseilles, adopted the designs and ideas that they saw in the textiles imported from eastern countries like India, China, Persia, etc., and adapted them to their own circumstances. The designs created in these early boutis studios were inspired by ideas they had seen in imported textiles and then quite logically evolved them into symbols and motifs significant to their own world. 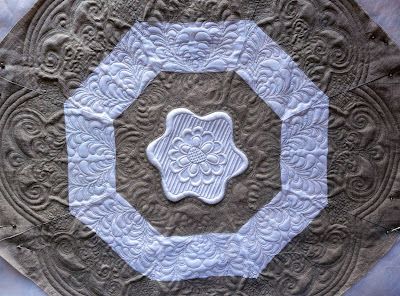 The technique of corded whitework was first seen in these imported works, and then evolved into a technique very specific to the south of France. 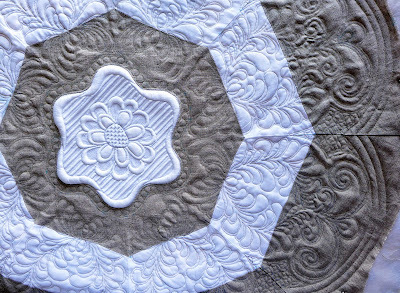 Although they held onto the basic concept of "white corded quilting", they adapted it to their present day circumstances to keep it relevant. 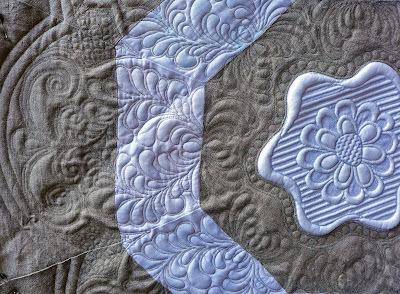 Close-up of the machine stitching. Respect for a tradition and it's historical significance does not have to be diminished by applying modern day technology. I am a firm believer that combining the two methods can enhance the beauty and significance of each. It's just a natural evolution for our time. 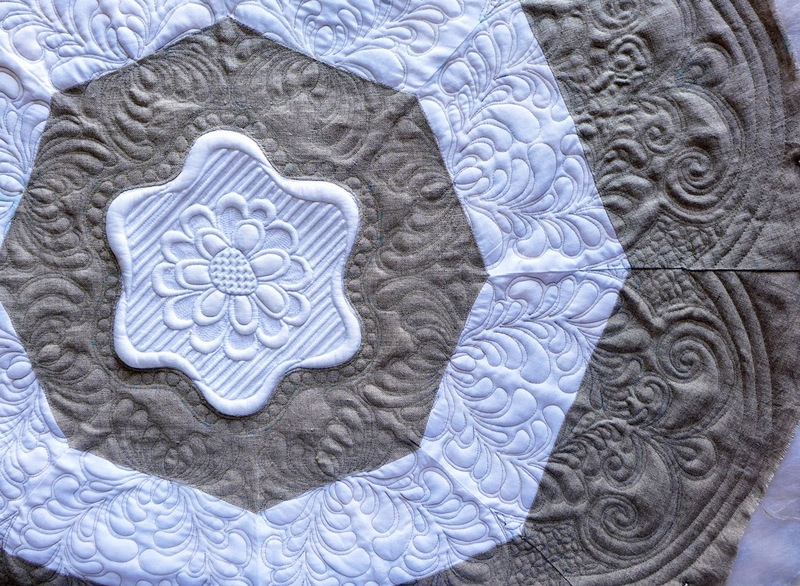 In this table topper, the hand stitched boutis piece takes centre stage, while the FMQ forms the frame. 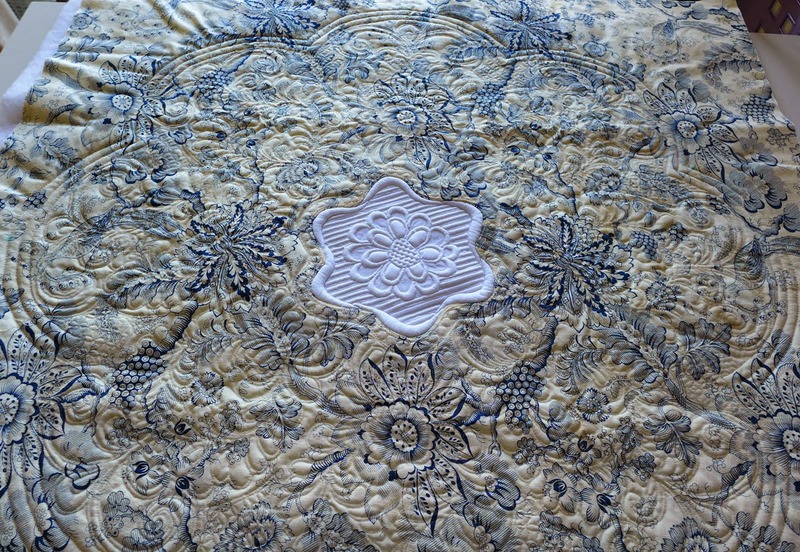 The backing fabric is a traditional blue toile de jouy cotton. All this having been said, I am not happy with the machine quilting on the linen. Although my floppy little crokinole board is somewhat camouflaged, linen is not user friendly to machine quilting. More on that next time. I think you may be a little too self-critical on this one! The design certainly allows the boutis to be the feature on the piece, and the FMQ is beautiful without detracting from the boutis. Maybe the next one will be better, but I would still chalk this one up as a win! I'm interested to read your comments on the linen - it's becoming trendy in modern quilting, but I can think of some drawbacks too. Thanks for your vote of confidence. 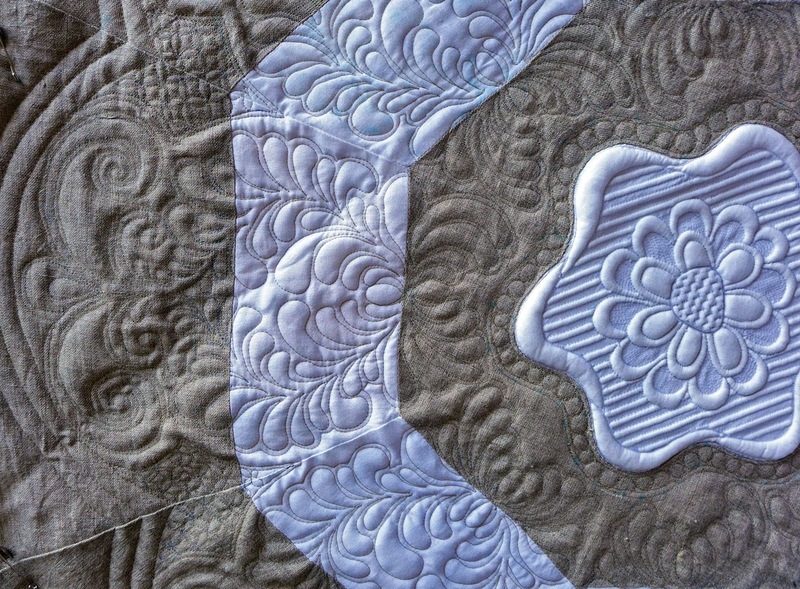 The photograph shows a surprising amount of relief, while in reality, there is not a lot of relief and the quilting does not show up very much at all. I've used linen once before, years ago, and should have remembered the frustrations I had at the time, because it's the same problems this time. That project remains buried deeply somewhere in the stash.